Opening times Fri–Sun 8.30am–2.30pm. Closed Mon–Thu. The Frasers have been selling their free-range eggs and artisan bread from their family smallholding since January 2014. Three small flocks of chickens provide the eggs, sold from the Stables from Friday to Sunday, when you can see them wandering around their fields. Jock is the baker, turning a longstanding hobby into a business, and converting one of their barns into a bakehouse. 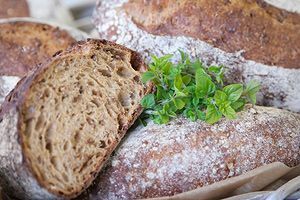 His slowly fermented breads are lightly yeasted or made from sourdough starters, and include Italian white, ciabatta, malted wheat, baguette and wholemeal loaves, with specials such as caraway and pumpkin seed, or sundried tomato and basil. Wheat flour from Mungoswells in East Lothian or Organic Shipton Mill are used. As well as selling from the smallholding, the Frasers attend local markets, including the Walled Garden at Righead Farm. Fraser family smallholding selling free-range eggs and artisan bread at weekends, with slow-fermented breads baked in a converted outbuilding. Looking for events in Crossgates?